Vancouver, Feb. 14, 2018 - Kincora Copper Ltd. (the “Company”, “Kincora”) (TSXV:KCC) is pleased to announce results from activities undertaken in 2017 across the wholly owned 1437km2 exploration license portfolio in the Southern Gobi, Mongolia. A total of 22 holes for 6,878 metres were drilled at three targets (East Tsagaan Suvarga, Bayan Tal and Argalant) with various associated assay results, age dating, green rock, petrographic, lithochemical and geochronological analysis. At two targets, 155km2 of ground magnetics and 171km2 gravity were completed (East Tsagaan Suvarga and Red Well). The review of the West Kasulu prospect at Bronze Fox by Mining Associates supported an exploration target of 416 Mt to 428 Mt grading 0.26% to 0.30% copper for up to 2,437Mlb of copper and 0.84Moz gold, ranking as one of the largest potential in-situ copper-gold systems in Mongolia and with only modest drilling. The potential quantity and grade ranges are conceptual in nature and based on nearest neighbour and ordinary krige estimates. There has been insufficient exploration to define a mineral resource and it is uncertain if further exploration will result in the target being delineated as a mineral resource. On the 2017 field season activities and the recent Technical Workshops, Peter Leaman, Senior Vice-President of Exploration, commented: “Last years’ activities were on budget, safely and successfully executed. Multiple targets were advanced, providing much improved knowledge for follow-up activities in 2018 that will be initially focused at refining proposed drilling at East TS and Bronze Box. 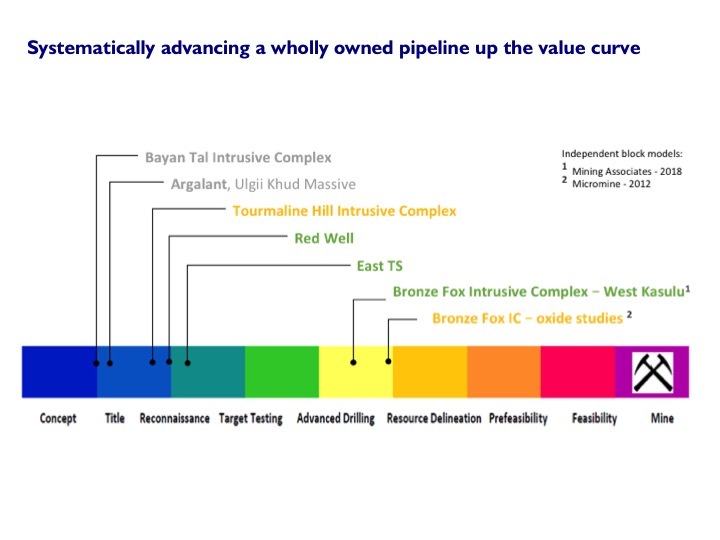 The scale of the exploration target announced for Bronze Fox helps illustrate the under explored nature of the belt and the recent Workshops have refined next stage activities to systematically advance our pipeline of targets. Further corporate and expansion activities continue to be pursued at a time of increasing interest towards new copper opportunities and Mongolia by industry groups”. Activities in 2017 were on budget, safely and successfully executed, systematically advancing the wholly owned 1437km2 district scale portfolio. The upcoming field season program is scheduled to commence next month, funded from the multiple–phase drilling and exploration budget secured in 3Q’17. Activities will focus on refining targets for expected drilling and next steps at both the East TS and Bronze Fox projects in 2018. Scheduled programs will also look to advance ongoing project generative targets and the earlier stage pipeline of existing prospects. Discussions with industry groups continue regarding the existing project pipeline as interest towards new copper projects and Mongolia increases. 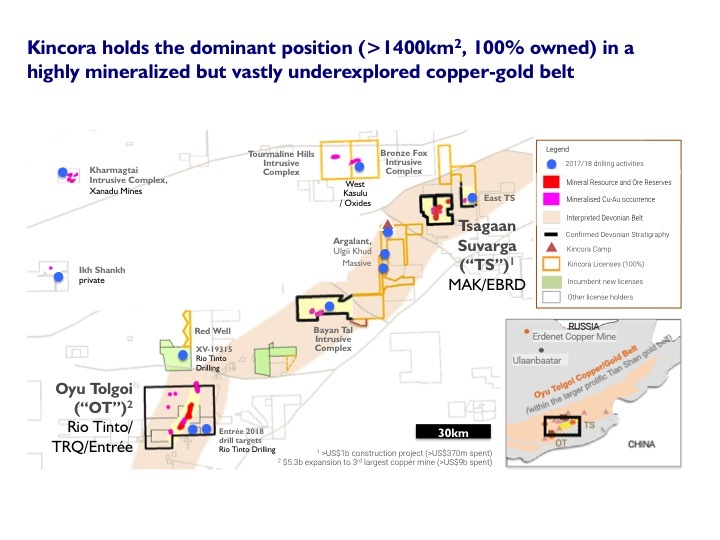 416 Mt to 428 Mt grading 0.26% to 0.30% copper for up to 2,437Mlb of copper and 0.84Moz gold (0.2% Cu cut off), ranking as one of the largest potential in-situ copper-gold systems in Mongolia and with only modest drilling. The potential quantity and grade ranges are conceptual in nature and based on nearest neighbour and ordinary krige estimates. There has been insufficient exploration to define a mineral resource and it is uncertain if further exploration will result in the target being delineated as a mineral resource. 4 Mt to 23.8 Mt grading 0.27% to 0.40% copper (0.2% Cu cut off and 1% top cut). The potential quantity and grade ranges are conceptual in nature. There has been insufficient exploration to define a mineral resource and it is uncertain if further exploration will result in the target being delineated as a mineral resource. A key work program in 2017 was the Mining Associates review of the West Kasulu prospect, which was the first major advancement at Bronze Fox since resolution of the previous dispute that between 2013-2015 restricted access to the full Bronze Fox Intrusive Complex (BFIC) and, within it, the West Kasulu prospect. The review and block model announced in the January 25th, 2018 press release supported a larger tonnage exploration target than internally expected at 416 Mt to 428 Mt grading 0.26% to 0.30% copper for up to 2,437Mlb of copper and 0.84Moz gold, ranking as one of the largest potential in-situ copper-gold systems in Mongolia and with only modest drilling. The potential quantity and grade ranges are conceptual in nature and based on nearest neighbour and ordinary krige estimates, and there has been insufficient exploration to define a mineral resource. It is uncertain if further exploration will result in the target being delineated as a mineral resource. 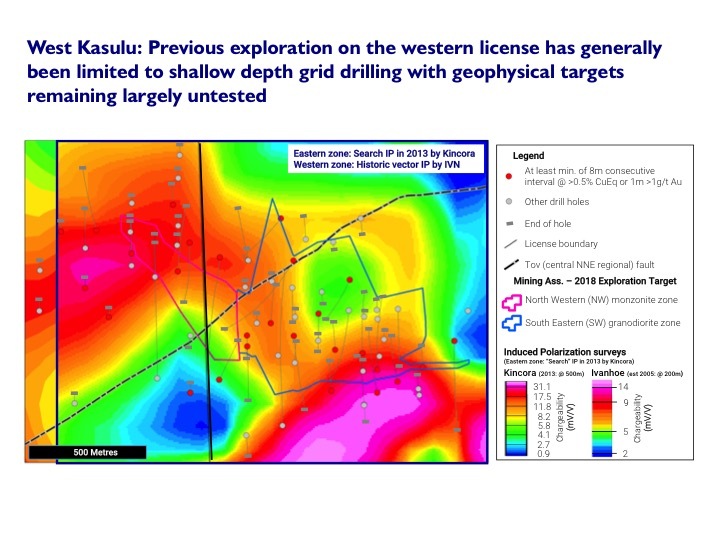 Kincora has undertaken only one drilling season (2012) across the full BFIC and West Kasulu prospect, noting this was prior to the “Search” Induced Polarization (IP) program (2013), which achieved better resolution and deeper penetration than prior survey’s. 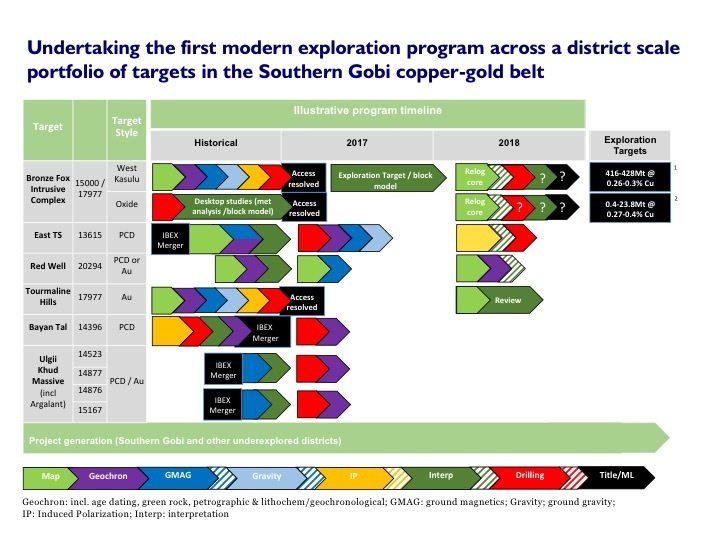 Results from this 2012 drill season were some of the most prospective in the wider Southern Gobi belt, attracting 14 NDAs with industry groups and a period of exclusivity. Full 2012 results and interpretation were impact by the aforementioned dispute, with only 24,139 metres in total (for 76 holes) having been drilled in total across the 1.3km strike at West Kasulu (by Ivanhoe Mines, Temujin and Kincora). 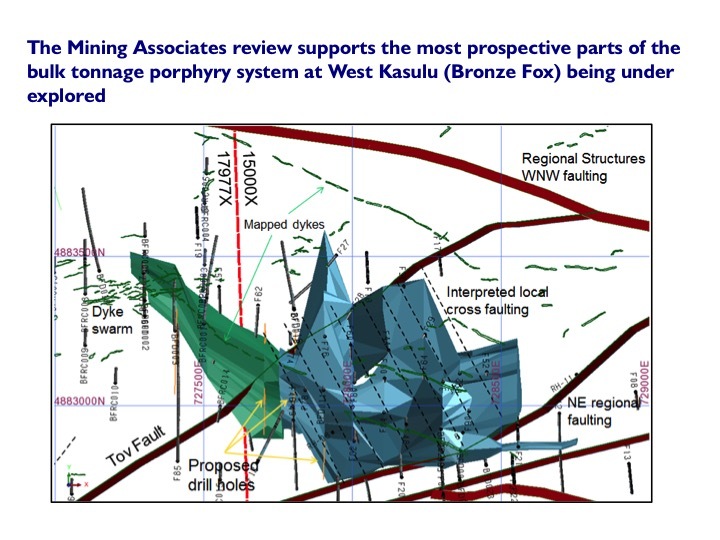 The Mining Associates review identified the “Tov” fault that bisects the West Kasulu prospect and that a North-West monzonite zone had more encouraging grades in holes F57, F85 and F62 (the latter including 37 meters at over 1% copper equivalent), indicating a more potentially favourable preservation level in the porphyry setting. As Figures 4 to 6 illustrate, this NW zone has had limited exploration, with only 4 holes for 2,170 metres by Kincora in 2012 and 24 holes for 3,841 metres by previous tenement holders. Drilling efforts by previous holders focused on soil and rock chip anomalies, often with zones of high-grade mineralization down hole, noting a largely untested IP chargeability anomaly at relatively shallow depths. The 2017 field season review Workshop revisited the West Kasulu prospect for a proposed “advanced” drilling program in 2018, focused on predominately targeting higher-grade potential in the NW monzonite zone. Post the Mining Associates review, Kincora has been analysing the previously relogged 11,991 metres of core (from 24,139 metres drilled at West Kasulu) and other work programs undertaken during the period of exclusivity in 2014 with a copper major (during the period of dispute for the western license and during the early stages of the copper price correction), and following up a number of the recommendations made by Mining Associates. The Mining Associates review and subsequent activities have assisted provide an improved geological understanding of the West Kasulu target and its bulk tonnage copper porphyry system. Encouragement is provided by the spacing between previous limited drilling in this NW zone, including up and down dip potential from previous higher grade intersections, previous drilling on the western license having been generally limited to approximately 100m depth grid drilling and supportive geophysics remaining largely untested (particularly in the western license). 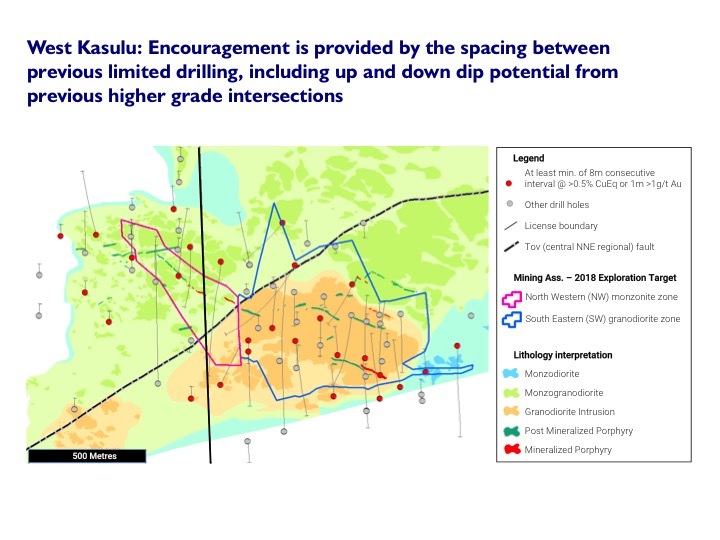 Further relogging of existing drill core is a priority in the upcoming Spring to assist refine targets for potential drilling at West Kasulu and providing further geological data that would be required to upgrade the Mining Associates exploration target to a NI 43-101 compliant resource. Initial steps have also been taken to support potentially converting the existing exploration license to a mining license. Between 2012/13 various internal and external analysis and studies were undertaken exploring the potential for a small-scale, near cash flow, oxide SXEW development project. These efforts were lead by John Rickus, Kincora’s late chairman who had considerable experience in copper development projects, with input from various specialist consultants. Initial mineralogy and metallurgical studies (including bottle roll tests by Wardell Armstrong), a block model (by Micromine), 10 infill drill holes, with investigations for sourcing acid, water and access to power where undertaken. A high level internal financial model illustrated favorable economics of such a development project assuming long term copper at $3.20/lb subject to successful infill drilling, further analysis on copper recoveries/acid consumption (due to some clays being identified in initial metallurgical and mineralogy analysis) and the systematic advancement of studies (noting this was prior to grid power being available in the immediate region, which would likely lead to a saving in capex and opex to original estimates, and the construction of a water well at Bronze Fox). Kincora is revisiting the potential of the oxide project in light of the relogging of core at West Kasulu (that will assist refine the oxide and transitional profile), the improved copper price and further drilling at Bronze Fox expected in 2018. Field season activities in 2017 confirmed Kincora’s interpretation that the East TS porphyry target sits in a brownfield environment on the interpreted eastern margin of the Devonian age Tsagaan Suvarga (“TS”) intrusion, which hosts Mongolyn Alt LLC’s (MAK) Serven Sukhait open pit development project and southern exploration targets on the western margin. MAK has invested US$377 million of a reported US$1,089 million total capital cost into the development of TS, which is forecast to annually produce up to 316,000t of copper and 4,400t of molybdenum concentrate. In February 2018, Fitch announced a credit review of MAK relating to a proposed US$200 million raising. Mapping, infill soil sampling and drilling has confirmed the targeted fertile and Devonian age quartz monzonite and monzonite intrusion at East TS. Half of the 14 holes from the maiden drilling program, for 3,452 metres, intersected the TS intrusion (two of which were underlying carboniferous cover), with background copper and molybdenum having been noted to date – refer Figure 8. Age dating, green rock, petrographic, lithogeochemical and geochronological analysis have been positive, with infill ground magnetics and maiden ground gravity survey’s completed post the first phase drilling program. 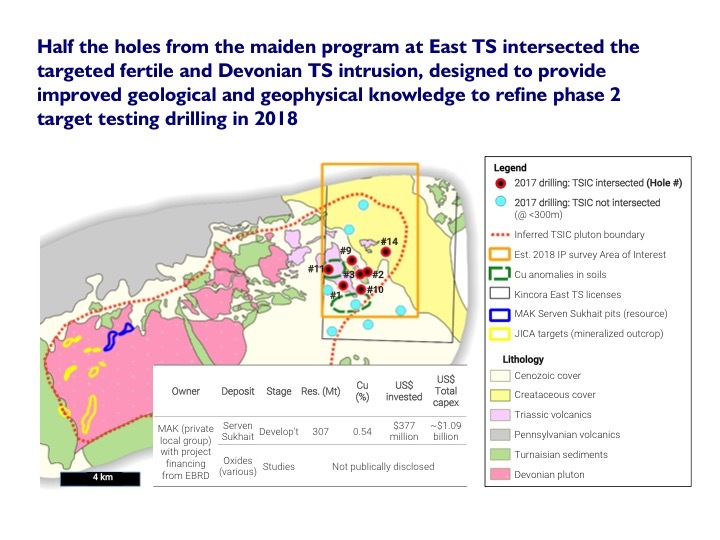 Activities to date support the East TS target being in the right geological and structural setting to the Serven Sukhait open pit (307Mt @ 0.54% Cu resource) and southern exploration targets on the western margin of the TSIC. Further encouragement is provided from both surface mapping and drilling that has intersected interpreted lower carboniferous cover above the Devonian TSIC, which coupled with improved interpretations of key structural and fault features, supports the concept of a potential preserved Devonian complex. The later is an analogue for East TS hosting an equivalent preserved high grade Hugo or Heruga orebody as at Oyu Tolgoi. With improved geological and geophysical knowledge, a two phase Induced Polarization (IP) survey is planned for the Spring to assist target sulphides within a 40km2 area of interest (5 km EW by 8 km NS), and is expected to lead to a second phase target testing drilling program in the summer – refer Figure 7. Kincora has engaged Barry de Wet as a specialist independent geophysical consultant to assist with planning, QAQC and interpretation of the upcoming IP programs. Barry is the former chief geophysicist for BHP Bilton and the Ivanhoe Mines Group (including Ivanhoe Australia and HPX). He has considerable knowledge of the Southern Gobi copper belt through his experience at BHP Bilton, HPX and being a former board member of IBEX, and is uniquely positioned to assist with the next stages of exploration at East TS. Ground magnetics and gravity completed in 2017 supports shallow cover within the northern section of the license with a historic reported Induced Polarization high anomaly coincident with outcrop. Initial ground truthing has failed to identify or replicate historic copper grade samples on the margin of the license with calcic-sodic alteration identified along eastern margin of the outcropping intrusion with positive fertility indicators returned from analysis undertaken this year. Kincora’s geophysics indicates deep cover to the southern section of the license, supporting an uplifted (horst) block in the central-northern portion of the Red Well license, relative to the deep drilling program completed by Rio Tinto in 2017 on the adjacent Turquoise Hill owned southern license. A soil and mapping program over the outcropping region, with a wider stream sediment sampling is planned at Red Well for the Spring. Previous rock chip samples and soils has identified extensive anomalous high grade gold, which has been the focus of informal mining (locally known as “ninja” mining) activities in 2014 and again over the 2017/18 winter. These activities have been in different zones, with 2014 activities focused on small pits and underground activities during 2017/18. Drilling by Ivanhoe Mines in 2006 and by Kincora in 2014 (limited to one drill season each) intersected small zones of higher grade gold, often with copper, but previous Induced Polarization has not supported a copper-gold porphyry target. A soil and mapping program over the outcropping region, with a wider stream sediment sampling is planned for the Spring. Previous IBEX drilling based on Zeus Induced Polarization chargeability high targets in carboniferous volcanics returned at and near surface copper-gold mineralization (highlights including IBEX006 with 18 metres @ 0.66% CuEq and 18 metres @ 0.75% CuEq in a trench). Subsequent ground magnetic indicated previous drilling occurred on the margin of an inferred Devonian target zone. Drilling in 2017 tested the geological model of a large ground magnetic anomaly under sediments and/or carboniferous overlying Devonian arc volcanics or augite basalt beneath the conglomerate marker previously intersected by IBEX. The 5 holes for 2,080 metres drilled in 2017, coupled with improved geophysical interpretations, have outlined that cover within the targeted area of interest was deeper than expected and failed to confirm favourable sedimentary rocks and carboniferous overlying Devonian arc volcanics or augite basalt beneath a conglomerate marker. The IP chargeability anomaly drilled with hole BT004 in 2017 returned background pyrite and chalcopyrite and appears associated with carbonaceous units which likely explaining the discrete soil and chargeability anomaly with green rock analysis not being encouraging for a copper porphyry target. The “Red Button” magnetic high feature in the central north-western section of the license remains untested. Activities in 2017 failed to provide the targeted vectors to refine targets for Phase 2 step out or infill drilling, which coupled with the depth of cover, means that the remaining target area is a higher risk proposition for a junior to solely fund. Discussions with potentially deeper seeing IP system providers have commenced which could be the next systematic step for exploration activities at Bayan Tal by both providing better depth to basement information (TEM capacity) and improved quality IP. During 2017, three holes for 1,346m metres were drilled testing inferred shallower porphyry targets based on ground magnetics on interpreted arc transverse structures. All holes encountered thicker than expected cover with magnetic bearing basalts explaining the targeted anomalies with age dating and fertility analysis not providing encouragement. The general region in the Ulgii Khiid Massive is thought to be prospective for lithium and REE, with further select ground truthing proposed in the 2018 field season. Concurrently with the 2017 field season Workshop, the technical committee and project generative team reviewed recent activities that have included multiple site visits and extensive desktop reviews in various prospective underexplored districts. Activities have focused on copper, gold and select other industrial commodity opportunities. Meetings also occurred with venders of various projects that have been reviewed. 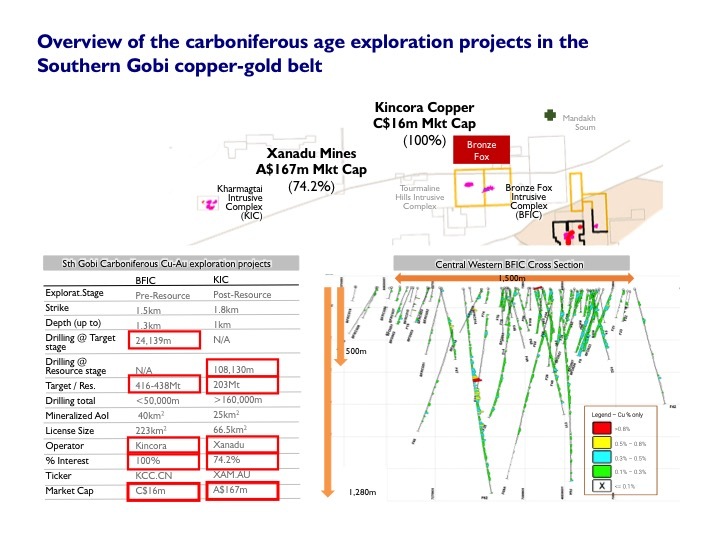 Kincora has undertaken three prior corporate transactions, secured two new exploration licenses directly from the State, and with its track record of operating in Mongolia, unique proprietary database (also benefiting from inheriting the previous project generative JV between Trafigura and Origo) and strong local presence, has a competitive advantage for further countercyclical corporate and expansion activities. The Company will continue to inform the market of any material corporate developments. The scientific and technical information in this news release was prepared in accordance with the standards of the Canadian Institute of Mining, Metallurgy and Petroleum and National Instrument 43-101 – Standards of Disclosure for Mineral Projects (“NI 43-101”) and was reviewed, verified and compiled by Kincora’s geological staff under the supervision of Peter Leaman (M.Sc. Mineral Exploration, FAusIMM), Senior Vice-President of Exploration of Kincora Copper, who is the Qualified Person for the purpose of NI 43-101.